Jerry Kelly responded on 5 December 2012 with this email detailing alleged errors in my recent Zapﬁana no. 1 post. I have annotated his email (adding text to his excerpts from my post to make the context clearer), indicating where he is right and where I believe I am. The errors that he found in my post have been corrected. ¶ There’s much italic in About Alphabets, used for several ways of differentiation — it’s even used on the title page reproduced in this review! ¶ The Frutiger is [sic] book is referred to, in a rather questionable comparison, several times. As said in AMA [About More Alphabets], a book to this scale on HZ’s typefaces would be over a thousand pages and weigh more than twenty pounds [that’s a low estimate]. But more importantly, the title About MORE Alphabets says exactly what I mean: More alphabets, not a comprehensive review of every alphabet. I did [not?] mean About ALL Alphabets or About THE REST of the Alphabets, or About the COMPLETE Alphabets (like the Frutiger volume states], I meant About MORE Alphabets, and my book is certainly that. ¶ this simply is not true. Aside from much new information [the punch cutters [sic] inflluence [sic] on Palatino, the Koch/Morris issue with the Novalis sample—a sample which has never been published before; the originals of Heraklit [Greek] and Michelangelo—again shown in images never published before; some of the more eccentric characters in the original Paalatino [sic] design which never made it into the ﬁnal version [again, never reproduced before]; the early unpublished drawing of Optima [more on that later], etc. I also add quite a bit of opinion about those typefaces. You may not agree with my opinion, but it certainly is unpublished before. You cannot, however, disagree with the new facts presented. “Despite the headline, [on the Specimen of the Novalis typeface, 1948 reproduced on p. 25 of About More Alphabets] this specimen is not a text on ‘The Work of Rudolf Koch’ as stated; it is instead actually written by Rudolf Koch on the work of William Morris. The mistake reveals a preoccupation with Koch.” (pp. 24–26)—where is the new information? 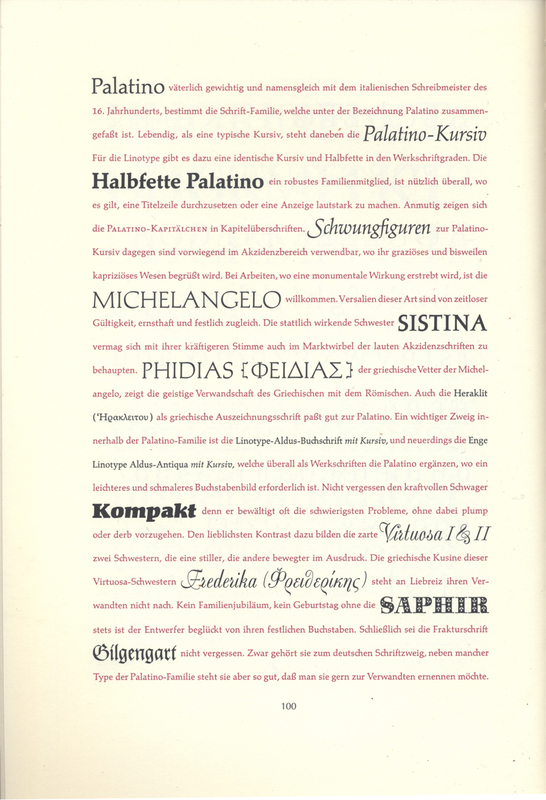 Did anyone actually think that this type specimen was a real text about Rudolf Koch? And what does Kelly’s clariﬁcation tell us about Koch’s influence on Zapf’s design of Novalis? “We can conjecture about how the changes may have developed for the Palatino typeface. Some of the revisions may have stemmed in a small part from the work done on the type by August Rosenberger, Stempel’s punchcutter, as was common in those days.” (p. 28) and “Zapf acknowledged his debt to Rosenberger, possibly because at least some small part of the enormous success of the Palatino type may be attributable to miniscule [sic] changes Rosenberger made when cutting the punches.” (p. 30)—this statement is full of “maybes”. There is no new information here. It has been well known by printing historians that punchcutters have minutely altered the drawings of type designers. See the relationships between Charles Malin and Giovanni Mardersteig or P.H. Rädisch and Jan van Krimpen. ¶ From accounts I have heard I do not believe this to be true, but how can Paul Shaw say this? Was he at every HZ talk in the 196Os [sic] [impossible]? Every talk has not been published, and if a talk was published it was most likely edited down and revised. ¶ If you read this in context a key point is being missed here: the context is a discussion of ITC’s success in their strategy for combating type piracy. U&lc had virtually no part in that strategy [though it did help the sales effort], while the naming issue was key to their combating type piracy; which I know from my discussions with Aaron Burns and Hermann Zapf. There were protections for typeface designs before 1973 but they were not copyright protections. Instead they were protections achieved through patents or industrial design laws. And current copyright protection of typefaces is based on the protection of the software data comprising fonts, not on the protection of the typeface design itself. The Vienna Agreement was published in England and can be read online through an Austrian website. Click on the link below. Edrich is an associate attorney in Denver with Kutak Rock LLP. His article was written while a student at the Sturm College of Law, University of Denver. He says that 11 countries established the Vienna agreement and signed it, but that ﬁve countries must ratify it and only two have (France 1974 and Germany 1981). ¶ Frankly, I do not believe that the very few sample settings in About Alphabets add much to the display of the letterforms, but I understand the page-layout reason for them. I think the straight alphabet showings are preferable. ¶ I simply couldn’t disagree more. While I say Marconi is a very important typeface, I do not feel it is one of Zapf’s most beautiful. The technical restrictions at the time severely handicapped Zapf’s design. He overcame the problems admirably, but the resulting font [sic] is nowhere near as handsome as Comenius. For all Shaw’s griping about my adulation for Zapf’s designs, it should be noticeable that I did not call Marconi “handsome” or “lovely” or use some other superlative. Also, Comenius is very rarely used in a book, so I think the choice is bold. It was also bold to substitute many characters from other fonts, something which apparently went unnoticed by the reviewer. ¶ Incorrect: the shade of the paper the illustrations are printed on actually matches the About Alphabets text stock. 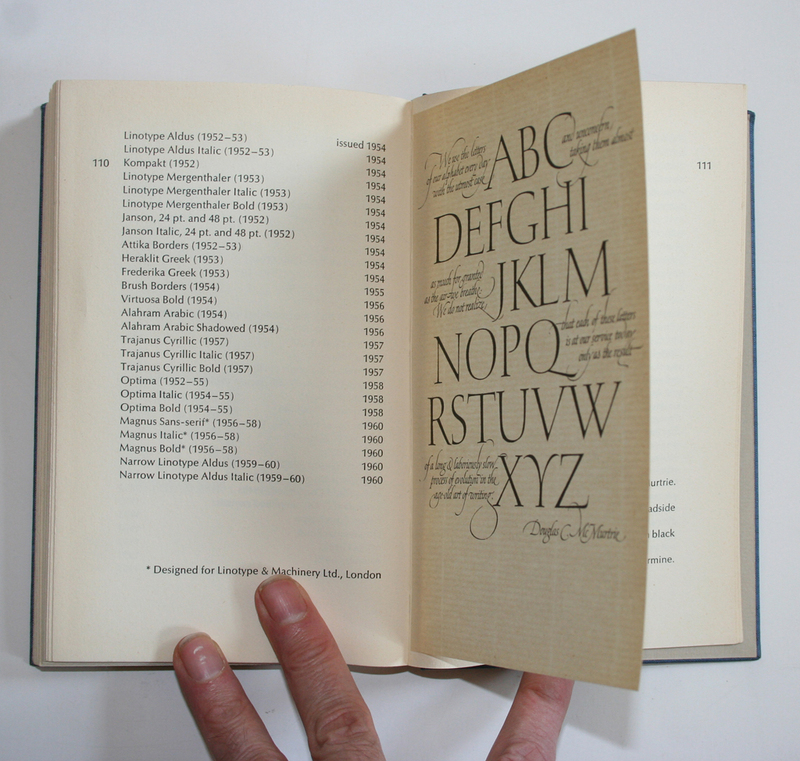 See the 196O [sic] Cincinnati catalogue, where the text is printed on the same stock as the illustrations for About Alphabets. Actually, the paper color for text and illustrations in AA is the same, but the illustrations have an overall background of a screen of black, making for the appearance of a gray [not beige] paper. Tip in illustration between pp. 110 and 111. About Alphabets (1960). ¶ When I mention using lead for ammunition rather than type Shaw says matrices are made from brass—which is true, but a minuscule amount of brass is used for matrix making, while tens of thousands of pounds of lead is used for type, which is why it was important for the Wehrmacht to divert the metal to bullet making, and why German typefounders needed to replenish the type supply after the war. Shaw just doesn’t get what I said, even though it is quoted it correctly. There’s much more, and there are several aspects of AMA that relate to personal conversations with Zapf that I did not want to allude to speciﬁcally. I hope the above will sufﬁce to point out some part of the misinformation [in] the review.